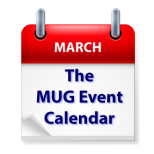 The last week of the month has a broad range of topics on The MUG Event Calendar. Virtual Reality is on tap at a Florida group, Qi charging benefits will be covered at a Connecticut group, and Photoshop Brushes will be “brushed up on” at an Ohio group. Los Angeles Creative Pro Users Group – "Philip Hodgetts returns for the premiere of Lumberjack Builder, a brand new, text-driven NLE, because existing NLEs are not good at working with transcription. Also, Everything you need to know about MPEG. The Motion Picture Editors Guild. The Union! IATSE Local 700. What is it? What can it do for me? Should I join? Why should I join? MPEG represents film editors, sound mixers and post-production craftspeople. That means you. Current MPEG President and Oscar® winning editor Alan Heim ACE will tell all you need to know. He will be joined by MPEG Membership Coordiator Shawn M. Marchetti. As some of you remember, last July 2017 editor Evan Schiff joined us to "show and tell" about editing the action movie John Wick: Chapter 2. It was a hugely popular meet. So we decided to bring him back, only this time to interview and honor editor Elisabet Ronaldsdóttir about her work on John Wick and Atomic Blonde among others. So welcome to Action Editing Chapter 2."